Perigord Blanc is the name given to the central region of the Dordogne, centred around Perigueux. Whilst it is in the Dordogne department it is some distance north of the Dordogne river. The name of White Perigord comes from the chalk landscapes of the region. The Perigord Blanc is split by the River Isle that runs through the centre of the area and passes through Perigueux. Although less visited than the other regions of the Dordogne, it has several attractions that will interest the visitor. 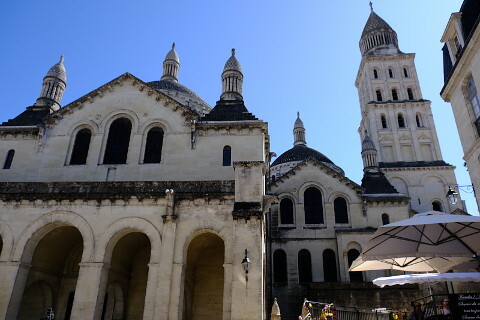 The capital of the Dordogne department and the most important town in the Perigord Blanc is Perigueux, a beautiful town with an incredible multi-domed cathedral and a lovely medieval centre. It has important Roman remains and an excellent museum of Roman items - the Gallo Roman Vesunna Museum. Its cathedral is UNESCO listed as an important stop on one of the pilgrim routes to Compostela in Spain. Next to Perigueux is the lovely Chancelade Abbey. Other attractive towns in this area include Neuvic (with its castle), Mussidan, Saint Germain du Salembre (with a pretty chateau) and Saint-Astier. Sorges is known as the "gourmet capital" for its coveted black truffles. The Chateau of Montreal and the Chateau of Neuvic are both open to the public. In Saint-Astier the Chateau of Puyferrat is open for guided tours by the owner in summer. This area is heavily forested and the Foret de la Double to the north of the region is very attractive, reminiscent of the forests of story books and much loved by walkers and fishers. For the other parts of the Perigord see: Perigord Pourpre, Perigord Noir and Perigord Vert.